There is something about those irresistible little seed beads. Delica’s, rounds, bugles, drops and all the new two-hole beads – once we start using them, we just can’t help but succumb to them. We collect as many colors as we can when a new style comes out, we “re-buy” our same favorite colors because we can’t remember if we have enough of the ones we use all the time. How have these little temptresses changed your life? When I came across a photo of a refrigerator covered with photos and kid drawings, I decided to create a beaded magnet. The simple heart design symbolizes the new family: the pink in the center is the new baby girl and each outline represents one of her parents. I wanted the heart to glow and shine with the light, so I used matte beads as the background and a few silver-lined beads for the heart. Since I wasn’t able to track down a pattern online for the earrings that I blogged about HERE, I figured out how to make them myself and then came up with this round variation. The pattern also works perfectly with 11/0 seed beads and 4mm fire polished beads but I’m not crazy about that size for earrings. If you make them that size, I suggest using Nymo D thread. Nymo B and FireLine are too thin to give the earrings enough stability. 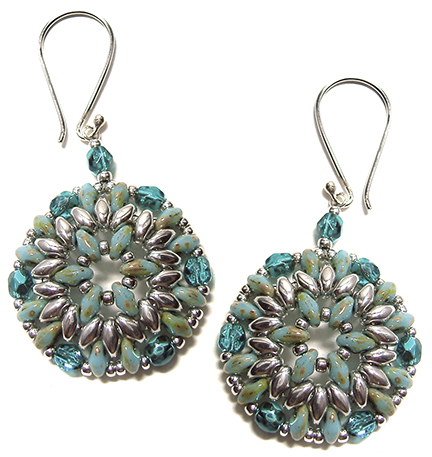 Deborah Roberti designs beading patterns. Her website offers some free and some bead patterns available for purchase. I highly recommend her bead patterns, not only are they extremely affordable and easy to follow, but they are very versatile as well. This category highlights some of the possible variations of her Bodacious Pendant and Earrings pattern. This pattern is available for FREE on the www.aroundthebeadingtable.com website. Free pattern for beaded necklace Sunny Day. You only need seed beads 11/0, seed beads 8/0 and drops beads. Free Czechmates SuperDuo Bracelet: Linda’s Tweaked Stacker. My free Stackers pattern adapted into a beautiful bracelet by Linda Genaw at craftyinspirationbylinda.blogspot.com. Bead weaving always seemed a bit out of my league — too complicated, beads too small, I don’t have the patience…. the list goes on. When my friend, Traci Otte, told me that one of her designs was going to be featured in the July 2014 issue of Bead Style magazine and, that it incorporated saucer beads (larger than seed beads), I decided this would be a perfect first project for me. 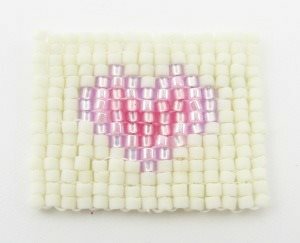 Video to help you learn to bead weave your own seed bead ice cream charm. You will need to know basic bead weaving skills to complete this design.